Facts about the 1952 Model K The engine had a relatively high (for a Side Valve) compression ratio of 6.5 to 1. The cylinder bore was 2-3/4" with a 3-13/16" stroke for a total displacement of 45.12 Cubic Inches. It came with an 1-1/2" Bore Linkert "Bombsight" carburetor Model M-53. The engine produced 30 horsepower. The motorcycle had a wheelbase of 56". Standard tires and wheels were Goodyear or Firestone and measured 19" by 3.25", front and rear. The gas tank held 4-1/2 gallons. The oil tank held 3 quarts. The transmission oil which was separate held 1-1/5 pints. Standard sprockets were Engine-30, Clutch-59, Countershaft-21, and Rear Wheel-51 teeth. Gear ratios were 1st- 12.37, 2nd- 8.74, 3rd- 6.21 with a final 4th- 4.77 to 1. Tire pressures were recommended at 20psi front and 22psi rear for a 150 lb rider. When this weight is exceeded by 50 lbs or more increase front pressure 1psi and rear 2psi for each additional 50 lbs. Spark Plug gap with circuit breaker (distributor) should be .025" to .030". Point gap is .022" Ignition timing is 19/64" BTDC, with the spark control in the fully advanced position. Cold Valve Tappet clearance is .004"-.005" on the intake tappets and .010"-.011" on the exhaust. Adjust every 1500 miles minimum. Forks hold 4-1/2 ounces dry or add 3-1/2 ounces after draining during regular service. These specs are for most K`s and remain the same unless noted later. 1952 Model K`s were available in the following standard colors: Tropical Green, Rio Blue, Persian Red, and Brilliant Black. Special colors at a slight extra charge were Metallic Bronco Bronze, White, and Metallic Marine Blue. 1952 and 1953 K Sport Models, (not KK), performance figures: The K was known to run the 1/4 mile in about 16.8 seconds at around 53 miles per hour. A 1952 Cycle World road test recorded a top speed of just over a hundred miles per hour, but this is perhaps a little optimistic. 1953: The 1953 K remained relatively unchanged. A faster acting throttle was installed. New saddlebags made of Royalite plastic were introduced along with a restyled Buddy Seat. Tires and wheels remained at 19" with the options being Goodyear, Firestone Champion or Firestone Sportsman with the front at 3.25" and the rear growing to 3.50" in width. A new Standard Solo Group was added to the option list which consisted of more cadmium plated and painted parts in place of chrome and subsequently a lower base price. The Model KK was introduced which was a factory performance enhanced model. The KK had much larger racing cams, carb modifications, head modifications and cylinder porting to match. It used the old WR racer's valves and guides and the new KR racer's lightened roller tappets. The cam set #25500-53 was also used later in the 1954, 55, and 56 KHK Super Sport Models. The standard colors for 1953 were Brilliant Black, Glacier Blue, Forest Green and Pepper Red. For a slight extra charge Cavalier Brown, Glamour Green and White were also available. 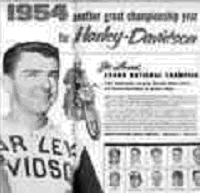 1954: The Golden Anniversary KH Sports and KHK Super Sports were big news for Harley Davidson and the motoring public. The popular Model K now evolved into the KH and later the KHK with many improvements. Foremost was the increase in engine size from 45.12 to 54.2 cubic inch displacement. This was achieved by increasing the stroke from 3-13/16" to 4-9/16" (4.562). To the best of my knowledge these were the longest stroke factory built Harleys to date. The flywheels are still available from Truett " Osborn in Wichita, Kansas. The new flywheels utilized tapered shafts and crankpins with retaining nuts, a much stronger system than the previous straight, pressed type. New rod bearing retainers were added for greater reliability. Engine cylinders were made taller to match the stroke increase and had redesigned ports and bigger intake valves. The KH had bigger cams and the KHK had the even larger racing type KK cams. The KHK cams are very close to the 53KR cams. The KHKs were hand built factory Hot Rods that also benefited from extensive additional port work and head machining. The headwork increased flow and made room for the valves necessary due to the high-lift cams. Valve springs were changed to the KR racer type. A new Linkert M-53A1 carburetor was added to the package. All this translated into a motorcycle that now produced 38 Horsepower and 1/4 mile dragstrip times were over two seconds quicker than the standard K. The KH would now do the 1/4 in 14.75 seconds. I don`t have performance figures for the KHK but obviously they would be even better. Now I would like to point out that several books often portray the K as being a sub-standard motorcycle, (in the power department), and not really even being acceptable until it received Overhead Valves and was called an XL. However a 1966 XLH took 15.5 seconds to do the 1/4, although a 1958 XLCH would run it in 14.25. The first Sportster in 1957 had only 7.5 to 1 compression and 40 Horsepower, then the 1958 was upgraded to 9 to 1 with bigger valves. Also the 58 XLCH was a lightweight stripped down motorcycle. No battery, etc. The point I`m making is that granted, the first year K was no rocket at 16.8 seconds but all the other ones, KK, KH, and KHK Models were quite fast motorcycles. Even with its` battery, full fenders, large FL type headlight, huge gas tank and full tins the KH was only a half a second slower than the XLCH. I wonder what numbers the KHK would produce" I feel the K`s deserve a lot more recognition for performance than they ever normally receive. Facts about the 1954 Model KH: To compliment the extra power the clutch was enlarged from five disc to seven. The primary cover was consequently wider. The cases were strengthened in various places. A stronger primary chain tensioner was made. Second and third countershaft gears were strengthened and received direct oiling. In 1955 countershaft 3rd and mainshaft 2nd gears were superceded to stronger ones and could be returned to HD for credit. Unfortunately due to the torque of the stroker many of them never had a chance. (Compared to state-of-art Andrews gears these early K gears look like they were formed out of a CheezWhiz can) The clutch gear was fitted with a Torrington bearing in place of the bronze bushing previously used. The cam, primary and countershaft covers were all factory polished. A one-way valve now returns excess primary oil to the crankcase. Speedster handlebars, an option in `53, come standard with the Buckhorns optional. The front forks now have rubber boots covering the tubes instead of chrome covers. The seat has been re-designed and is similar to the Model 165. The brake shoes went from aluminum to pressed steel construction. The lining-type has been changed. A new oil-pressure switch was used. With the solid engine sprocket standard, a new-design compensating sprocket was available as an option. 1952 and 53 frames were recognizable by their hollow foot peg mount tubes. For 54 they are solid. Also the rake and trail was slightly changed and the steering neck beefed up for better stability. The gas tank emblems were the same but the extra trim was all dropped. The rear shock absorbers now had chrome covers and tops in place of the Royalite plastic ones. The front fender carried a 50th Anniversary Medallion on top in front. Facts and figures on the KH: The gearing was as follows. Engine sprocket-30, Clutch- 59, Countershaft-22 and Rear Wheel-49 teeth. Gear ratios were 1st- 11.55, 2nd- 8.35, 3rd- 6.37, with a final 4th- 4.58 to 1. Standard tires and wheels were Goodyear or Firestone 19" by 3.25" front and rear. Optional at no extra charge were the same combinations in 18". For a slight additional charge you could order a Goodyear Grasshopper 18" by 4.00" on the rear only. Ignition timing was 19/64" BTDC " 11/32" BTDC for the KH " the KHK respectively, with the spark fully advanced at the twist grip. The Cold Valve Tappet Clearance is .004" intake and .006" exhaust. Golden Anniversary KHs and KHKs were available in the following standard colors: Pepper Red, Glacier Blue, Forest Green, Anniversary Yellow and Daytona Ivory. For no extra charge the tanks could of been ordered with one color and the fenders another. The new KH and KHK motorcycles were headline making motorcycles, representing the best of 50 years of Harley Davidson producing fine American motorcycles. 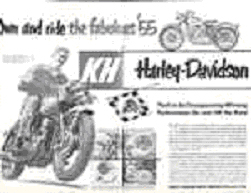 1955: Hot rodding is alive and well in the USA and in 1955 Harley Davidson is right there with the KHK. Offering "Exceptional performance, that extra tremendous acceleration and that burst of power and speed the instant you touch the throttle on the KHK for 1955." Besides all the normal hand built KHK goodies the 55 offered mirror polished ports and cylinder heads, including the outside of the heads. The Factory advised to order yours early, as "A special model like the KHK is not produced in the normal channels of production. To get that extra horsepower takes time and loving care. The quantities, that can be produced, are rather limited and sufficient time must be allowed to fill orders. The extra net charge for this model is modest in comparison with its` extra performance and the joy it will bring to the fortunate owner." ($68; Some quotes from a 55 sales ads.) Sounds enticing, to say the least. Facts about the 1955 Model KH: To help transmit this fine power more reliably and to expedite transmission repair the 55 received stronger cases with a `trap door` design built in. This allowed complete overhaul of the transmission through the primary side without having to split the cases as with earlier models. This was actually a running change in 54. Better lubrication of the mainshaft right bearing is achieved by casting a pocket in the case to collect and feed oil to this bearing. Once again transmission gears are improved for strength. C-shaft third and M-shaft second are now forged from 4615 steel, an improvement over the previously employed 8617 bar stock. Other changes include: Stronger right side transmission case, longer shifter retaining bolt on access door holds tighter, larger starter gear retaining nut, steel wear plate installed between kicker shaft and cases and a larger key is used on the flywheel sprocket shaft. Transmission and engine specs remain the same except more fine tuning on the motor and C-shaft sprocket size went from 21 to 22 teeth. Stock wheels are now 18" with 18" by 3.50" tires std. and larger ones optional. The C 1026 steel tubing used in previous frame construction is replaced with chrome moly for 55. The frame has a slight neck angle change and for the first time re-enforced front downtubes. This was complimented with one inch shorter fork tubes resulting in one inch of increased trail. This improved handling. To keep the front fender's duck tail from hitting the front Safety Guard it was simply cut off. To help handle the massive torque the rear wheel hub was greatly increased in size and the rear spokes were up-graded to BigTwin size. Earlier wheels were being torn apart from the torque. An oil port in the clutch cable was introduced for ease of lubricating. The speedometer head size is increased for durability and accuracy. Previous speedos had short head life and bouncy action. The jewel for the pivot shaft has been increased in hardness and a spring dampener added. The entire speedo is now rubber mounted as is the internal mechanism. The steering dampener is changed with a tension spring added to hold the adjustment. The spark and tool box cover studs have been increased in size. A re-designed Buddy Seat is offered with more padding and a Royalite cover replacing the leather one. Gas tanks remain the same except the emblems now carry the HD V-`swoosh` emblems. The front fenders carry either a KH or KHK 1955 Medallion. 1954 facts and figures are carried over to 55, except noted above. The 1955 KHs and KHKs were available in the following colors: Brilliant Black, Aztec Brown, Atomic Blue, Glamorous Hollywood Green, Pepper Red, Anniversary Yellow and Silver or White for Police duty. As before, tanks can be ordered in one std. color and fenders another. For $10 extra you could get the Hollywood Green paint on the tank, fenders and spark coil cover and oil tank. The 1955 Ks were American-made middleweights with distinct features and advantages over all similar-type motorcycles. 1956: The transportation scene in America is changing fast with some 46,000 miles of Super Highways constructed, allowing the public and the 56 KH Sport and KHK Super Sports riders a whole new playing field. All the Ks are now quite refined and have enjoyed success on and off the race track, and in many forms of competition. The factory KR racers have dominated the National Championships, winning every class `C` race with the efforts of brave men like Joe Leonard, Brad Andres and others. Joe raced for Tom Sifton, who owned HD dealerships and Brad was backed by his father who also owned dealerships. These two stables were at the top of the list for K HP development. Joe said the Factory would give them a $1,000 bonus for each HP found. Joe ruled the 1954 season, but in 1955 he had his hands full. Brad was coming up fast and edged Joe out for the 1955 Championship. The Andres shop wisely asked Tom to sell them a KR racer in 1954, which he agreed to. Joe`s comment later `that`s fine, but did you have to sell him our best one?` Joe regained the crown in 1956 & 1957. Joe is the only racer in the world to win back to back National Championships on Motorcycles and in USAC Cars. Plus the nicest fellow you could ever meet. Technical input for reliability and performance was born at the race track and lives in the new KHK Super Sports model. The newly popular entertainer Elvis Presely chose a Pepper Red KH for his first Harley V-Twin and was pictured astride it on the cover of The Enthusiast magazine. The new 56 Model Ks ran more mechanically reliable and handled the road better than ever. Facts about the 1956 Model KH: The 56 is lower and sleeker looking thanks to major changes including an all newly designed Chassis with a much lower center of gravity. Powerplant refinements include a new chemically treated cellulose Air Filter element with a center holdown screw securing the cover and sealing against dust much better than the previous J-Slot type. Polished heads, intake and exhaust ports increase flow and resist carbon deposits. The Oil Pump has been made more reliable and has increased oil return capability to avoid oil stacking in the crankcase. It has a woodruff key replacing the pin and the relief valve has been eliminated to avoid the oil tank draining into the crancase while the motorcycle is parked. The Oil Tank now has a heavy metal protector on the bottom to guard against drivechain damage and a cutout to allow clearance for the new Chainguard and chain angle due to the rear wheel traveling higher into the fender cavity. The Carburetor now sports a bracket to help secure against vibration and loosening of the intake manifold nuts. The Kick Starter crank gear plate is stronger. The Transmission Gears have more beef again. The mainshaft second and third gears and the countershaft second and third gears have larger tooth sections resulting in higher beam strength. The mainshaft second gear engaging dogs are increased in size and number, from four to five. The third gear dogs are also huskier. The forging process has also been changed to make these gears tougher. The Mainshaft was also beefed up mid-year. Major changes in the newly designed Chassis include a sturdier 1" raised Steering Neck, 9/16" shorter rear Shock Absorbers, stronger Seat Casting with lower Seat position and stronger upper Shock attaching area and Shock Mounts. All this plus new larger Shocks with more oil capacity and nice Chrome covers, stronger Swingarm coupled with 18" Wheels front and rear and Speedster Handlebars equals a lower, better handling Model K. The new stance brings a change in the top mount of the Safety Guard. Spring steel Cable Guides route them securly in the handlebar clamp area. The new Frame Blueprint remains basically the same through 1966. The 1956 Frame is one year only, as it has a Cast Upper Engine Mount while the 1957 and later have a Fabricated Steel Mount of basically the same dimensions. Frame assembly line Date codes are found on the right side of the Seat Casting, with the letter representing the month and the number the year. An example would be `6A` meaning January 1956. All 56 frames I have seen have a factory flattened backbone above the rear cylinder head in anticipation of the extra clearance needed for the enevitable switch from Flathead to Overhead Valve type cylinder heads. This plan to use the OHV layout was actually developed pre 1952K. A working 60 Degree OHV design was dropped in favor of the known 45 Degree Side Valve design. Adjustments for the OHV were now happening. Fuel Tanks were slightly different for 56, utilizing a Rubber Hose crossover piping in place of the earlier Fitted Copper type. Mid-56 Tanks carry .5 gallon less fuel due to Rocker Box Clearance built into the bottom section. This is a half year tank. It has the clearance indents for OHV, yet retains the Fuel Filter Valve on the left for Flatheads, and has the 55-56 V-Swoosh emblem mounts. 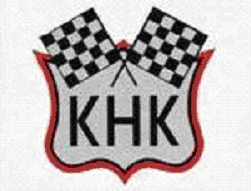 The 1956 KH and KHKs feature a racy slash panel section under the tank emblems. The 56 had a one year only rear Hub Bearing set up using Torrington needle bearings. The 55 Big Twin Taillight has been adopted for the K for 56, featuring a Lucite Lens with a built in magnifier section directly over the bulb. All other specifications remain basically the same as previous models. 1956 KH and KHKs were available with the following color combinations: Pepper Red with White slash, Atomic Blue with the new Champion Yellow slash, Champion Yellow with Black slash and Black with Champion Yellow slash. For an additional $5 you could order Flamboyant Metallic Green with White slash. The 1956 Ks were more refined than ever, and to recieve extra recognition the 1956KHK Models carried a special decalcomania in color carrying the `KHK` letters on a Shield with crossed Checkered Flags at the top, placed on the sides of the oil tank and tool box. "Happy and proud indeed will be the owners who ride these special KHKs in 1956" sayeth the Factory.